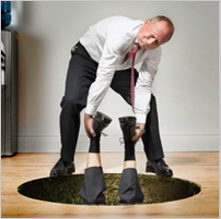 Are you Stuck in a Hole with your Policy or Financing? You are completely unaccustomed to being in this position. You are a savvy investor or businessperson and never buy an asset without carefully calculating its cost and projected return, weighing meticulously the benefit vs. the risk. Yet you somehow find yourself in a hole, in need of a loan to pay for the expensive premiums on your large life insurance policy. Refinance an existing premium finance loan Finance an in-force policy, not previously financed. We will examine your current coverage and/or existing expiring loan, if you have one, and find an option that will allow you continued access to your death benefit, without your having to write large checks for premiums every year. Customers with expiring short term loans. Customers looking for a first time loan on an in-force policy. Customers who don?t want to settle in the secondary market. Those who wish continued access to their death benefit. Clients who paid for a policy and now find the premiums too burdensome. Clients who have had a health change resulting in a sharply lowered life expectancy. Clients needing an extension on an existing loan to buy time to consider options. Let us pull you out of the hole! Download and fill out our simple application.